May 21, 2010 - Back in February British Airways cabin crew members announced through their union, Unite that the majority of its members had voted to strike. While most, 75 percent, of BA's crew are at the top of their earnings, the dispute is not about pay. The dispute was triggered by in November 2009 by BA through its new work practices of reduced cabin crew on its aircraft. BA's refusal to consult with the union on these changes meant for the union that BA had broken with the long-standing negotiating structures. British Airways cabin crew held a weeklong strike that forced the airline to cut back on service and it had an impact on merger agreements with Iberia Airlines. Due to Icelandic volcano eruption causing a number of passengers to became stranded abroad, the cabin crew temporally called off their strike. On May 10th Unite reported BA management failed to offer any new proposals to settle the dispute and as a result the cabin crew would hold a 20 day strike between May 18-22, May 24-28, May 30- June 3 and June 5-9. British Airways went to court with the hopes of having the court order to crew to remain on the Job. Pilots at British Airways warned that 'the unprecedented strikes announced by BA cabin crew for May and June will seriously threaten BA's ability to maintain job security and terms and conditions of employees in all parts of the company. 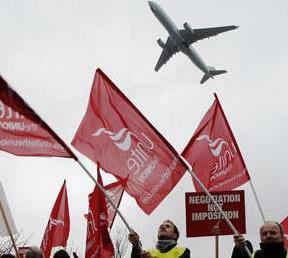 On Thursday the court ruled in favor of the cabin crew not what British Airways was hoping for. BA cabin crew union, Unite stated “the court of appeal has overturned an injunction against the cabin crew's strike over a technical breach.”We are delighted to have won today. Justice has been secured. Had it not been, the right to strike would now be hanging by a thread. "BA must now accept that negotiation not litigation is the only way to secure the settlement we all want. However, further strikes will be unavoidable if the company does not immediately work with us to address the outstanding issues. "This is a pause for peace. Willie Walsh must make the most of it" said Tony Woodley, Unite joint general secretary. British Airways response to court order, “we are very disappointed for our customers that Unite’s appeal has been upheld and that the union intends to go ahead with its unjustified and pointless strikes. We will implement our contingency plan to keep British Airways flying. We are confident that thousands of cabin crew will ignore Unite’s strike call and help us fly more than 70 per cent of the customers who were booked to fly with us in the period targeted. “We will run a full program at Gatwick and London City. At Heathrow, we will operate more than 60 per cent of our longhaul operation and more than 50 per cent of shorthaul. “Unite’s strikes have failed twice and they will fail again. We have put forward a very fair offer that addresses the concerns Unite has raised over the last 15 months. We believe cabin crew would accept it if it was put to them in a fair and secret ballot”.